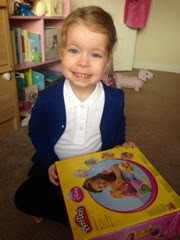 This girl started nursery school last week and already she has an air of maturity about her, in that 'I know best' way. She has become like a little parrot, repeating things we say in context and at a later date, it can be fairly funny but also slightly mortifying. Shamefully one of my sayings "Oh God" has been something she has started to say, So now if she drops something like lego, she'll roll her eyes and say it. I'm now trying hard to say 'gosh' instead but she hasn't picked up the change. The other day she said "mummy don't come downstairs, I've made a right old mess", that comes from hubby and I found it really funny as it sounded exactly like he says it. My other two bad habits are saying 'right' at the begining of every sentence and now she copies that. I also say 'ok?' at the end of a sentence which again she now says. The other week, weary with tiredness I managed to drive the car into the side of a kerb at Bluewater, damaging one of the tyres (our third in two weeks) so I became slightly distraught and said 'sh*t' and all I could hear through my shocked tears was "sh*t, sh*t, mummy what does sh*t mean, mummy what's sh*t". As you can imagine, not my finest hour! It's funny but also alarming that what we say comes directly out of their mouths and I'm hoping that they don't come out at school!